BONIFAY, Fla. — There’s a big difference between north Florida and South Florida. As different as Alabama and New England. And on Tuesday, those distinctions will likely play out as Florida voters decide who to give 99 Republican delegates to in the race for president. The Florida GOP primary is considered a pivotal moment in the campaign: The winner-takes-all contest could mean a huge boost for Donald Trump, or the death of Marco Rubio’s campaign in his home state. But the Florida primary isn’t easy to predict. The differences between residents in Bonifay in north Florida and those in Broward County in south Florida are about as stark as voters in Birmingham, Alabama, with those in Boston, Massachusetts. In Bonifay in Holmes County in the north, there’s a sign pointing to a bait shop three miles down the road intermingled with campaign signs for sheriff, school superintendent and property appraiser. They don’t like Democrats even if they are Democrats (because they are Dixiecrats). Nobody blinks if a Confederate battle flag waves in front of a home and people driving off Interstate 10 might think they’re in Alabama, which borders the largely rural community. A day’s drive south is Broward County. Broward is a place where it can take hours to get off Interstate 95 during rush hour, people speak with New York accents and President Barack Obama won enough support to cancel out dozens of places like Bonifay to carry Florida and win two terms as president. In north Florida, boiled peanuts are commonplace. In South Florida, you’re more likely to find boiled yucca, a staple in Cuban restaurants. And on Tuesday, when Florida awards 99 delegates to either Donald Trump, favorite son Sen. Marco Rubio or, much more unlikely, Sen. Ted Cruz or Ohio Gov. John Kasich, there’s a good chance there will be a difference in who north Florida supports and who prevails in the three-county area known as South Florida. Holmes County in the north, which includes Bonifay, actually has more Democrats than Republicans, but many are Dixiecrats — Southerners who register as Democrats but vote Republican. Despite the party advantage, Barack Obama earned only 15.2 percent of the vote in 2012. Smith takes pride in saying Holmes County gave more support to Rubio’s 2010 Senate campaign than any other Florida county. But this year, he said the vote in the Republican primary will be close. He agrees that the primary results in Georgia and Alabama, which Trump easily won, could indicate the businessman and reality TV star will do well in north Florida. Exactly why a New Yorker is winning the hearts of Southern voters is something of a mystery. Rubio will probably do better in South Florida, the state’s most populous region, with more than 800,000 Republicans in Palm Beach, Broward and Miami-Dade Counties. 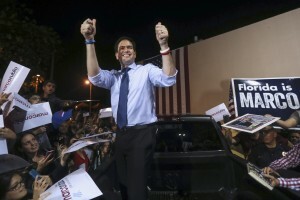 Rubio is from Miami, where the population in his home county outnumbers Holmes by a better than 131-to-1 ratio. Even throw in conservative strongholds like Jacksonville and Pensacola and South Florida votes dominate the state, and tend to be a bit more liberal even among Republicans. Maria Penton-Oliver, of Davie, a city southwest of Fort Lauderdale in Broward County, has already voted for Rubio. She’s no fan of Trump. She said she has “100 reasons” not to vote for the billionaire. She thinks Trump speaks “from both sides of his mouth,” saying that the billionaire businessman talks tough about immigration but takes advantage of the H1-B program to hire foreign workers at his Mar-A-Lago resort in nearby Palm Beach County. Not that Rubio won’t get any support up north. Jerre Richter stood on her porch in Bonifay and said she’s voting for him because she thinks that’s who God would think makes the best president. She said her faith plays a large part in casting her vote. But the 83-year-old former teacher and current pastor said there are plenty of others willing to cancel out her vote. “Somebody said to me the other day, ‘Who are you voting for?’ And I said my current plan was to vote for Rubio. And they said some junk about him not being from the United States. I don’t remember the term they used, but like he was a foreigner. I said, ‘What difference does that make? It’s more the man, what he stands for, what he is and what’s he going to do,'” Richter said. Bustos, an AP national political writer, reported from Miami.